Home Gear & Ammo Ammunition What’s the Deal with TSS Shotgun Shells? Although not new, TSS has recently been brought mainstream by Federal Ammo. Turkey hunters are salivating, but the new load also has plenty to offer those who like a shotgun for home defense duties. Are the new TSS shotgun shells all they’re made out to be? Can they be used for home defense? Tungsten is denser and harder than lead. Whereas water is 1 g/cc in density, lead 11.3 g/cc, tungsten is 18 g/cc. The density allows the TSS to fly further. Hardness allows shot to maintain its form, thus create a better pattern. Tighter patterns make smaller gauges more viable on longer shots. Unless you have been living under the proverbial rock, you’ve likely heard some scuttlebutt about TSS shotgun shells. TSS — meaning “tungsten super shot” — has become all the rage in the shotgun world, mainly in turkey hunting circles. But a little testing proved it can do so much more. TSS is not new. An almost cult-like group of turkey hunters has been handloading TSS for several years. Reports of this mysterious shot began to surface on the internet, and several websites sprang up where members of the TSS cadre would meet and talk over recipes for loads. Word of incredible patterns at ranges previously unheard of spread across the land. The word was out, and for shotguns, TSS was the new magic metal. Federal Premium Ammunition introduced a new TSS shotshell this past January at SHOT Show, and the buzz was immediate. The HeavyWeight TSS load was greatly anticipated and hit the market about a year after Apex Ammunition started selling TSS shotgun shells. The HeavyWeight load features TSS shot in No. 7 and No. 9 shot in three gauges: 12, 20 and .410.
Who needs a .410 turkey load? One of the virtues of this shot that TSS devotees like to preach is that the heavier-than-lead material makes the smaller gauges a viable option over the bigger 12-gauge boomers. Besides the TSS shot, Federal’s new load has some other qualities going for it, including buffering the shot and a rolled crimp on the end of the shell. Buffering the shot is as important with TSS as it is with lead. “Buffer evenly distributes the ignition force throughout the payload, allowing for uniform separation of the shot at muzzle exit,” said Federal Premium Shotshell Engineer Adam Moser. “Buffering lead shot also helps reduce pellet deformation caused by ignition forces. The 3-inch No. 9 Federal HeavyWeight TSS shoots with a muzzle velocity of 1,200 fps, and put 611 pellets in a 5-inch circle from 10 yards with an extra full choke. When used with an open bore above, the pattern turns into a clean, single hole. Sound backward? It’s all about the relationship between the choke and the wad. “A roll crimp on the shell helps provide uniform compression of the buffered payload, which generates consistent ballistics and better pattern efficiency,” Moser added. Combined with a clear plastic card wad, it also ensures that the entire buffer remains sealed inside the cartridge. Another important aspect of the HeavyWeight TSS load is the FliteControl Flex Wad, which was introduced with the launch of Federal Premium’s redesigned Black Cloud waterfowl shotshells. The wad’s design is meant to improve pattern density and consistency when fired through ported and non-ported chokes. “The wad’s redesigned rear-deploying brake fins and side-mounted vents stimulate the payload for separation from the wad at the right moment for the densest, most consistent patterns,” said Dan Compton, Shotshell Product Line Manager. To do this, Federal Premium engineers beefed up the wad’s brake system, starting by reinforcing the wad’s flexible rear fins with sturdy supportive gussets. Intrigued as always with anything that comes out of shotgun, I decided to find out more about this scattergun magic potion. What is TSS, anyway? How does it compare with conventional shotshells? Are TSS loads good for anything besides turkey hunting? Can I really kill turkeys at 85 yards with TSS (OK, I’m kidding on that one, but just a little)? Pay attention now, class — today’s lesson is on Tungsten Super Shot. Tungsten is a rare metal found naturally in the earth and is also known as “wolfram.” The name tungsten comes from a Swedish term, tungs sten, meaning heavy stone, and it’s used to make several items including tungsten-carbide drill bits and filaments for light bulbs. Although tungsten is mined all over the world, most comes from China and tungsten shot is made there as well. The TSS shot we shoot is about 95 percent tungsten, with the remainder being made up of nickel, iron or copper. For turkey hunters, comparing lead and tungsten is like comparing apples to oranges. Where tungsten really shines is in pellet count (using smaller pellets while retaining energy), and especially at extended ranges. It’s tungsten’s weight (density), along with its hardness, that makes it shine as a pellet for shotshells. Density is usually measured in grams per milliliter, and most tungsten shot is 18 g/cc. Water, by comparison, is 1 g/cc, and lead is about 11.3 g/cc. For our purposes here in comparing the performance of shotgun pellets, think of two pellets of equal size— one is lead and the other is tungsten. Now, think about playing fetch with your dog and throwing two balls of equal size; one is a whiffle ball and the other is a baseball. The baseball is heavier and denser than the whiffle ball, which will fly farther and hit a target with more force. Don’t do as I did and confuse density with hardness: they are two different things. If you put a lead and a tungsten shot pellet in a set of pliers and clamp down on them, you’ll deform the lead pellet long before the tungsten. A shotgun is an imprecise weapon, and shot pellets have a wild ride from the muzzle to the target. Lead pellets are bumping into each other and shot in the rear is pushing on pellets in the front of the load. Lead will deform under these conditions, and misshapen pellets tend to fly erratically and make holes in the pattern. Tungsten shot, being many times harder than lead, maintains its form and will hold a better pattern. Because it’s harder and heavier, smaller tungsten shot will perform on the level of much larger lead shot. Number 9 shot, once thought of as unheard of for hunting purposes, has become the darling of the TSS world. The difference in loading No. 9s compared to No. 4 shot is phenomenal. A 3-inch, 1¾-ounce load of No. 9 shot will contain about 637 pellets, while the same load of No. 4’s will give you about 256. It’s all in the math. There are dozens of shotshell loads available for comparison to TSS ammunition. To simplify things, I wanted to compare TSS performance with a standard turkey load and a home defense shotshell. I have used Remington Nitro Turkey loads for several years and know others who have as well, and I’ve seen more than a few turkeys fall to this shotshell. While the TSS patterns are impressive, you pay for what you get. A cache of Federal HeavyWeight No. 9s will run you north of $40 per ﬁ ve-count box. The Remington Nitro Turkey loads (12 gauge, 3 inch, 1 7/8-ounce No. 4 lead shot) and the Federal HeavyWeight TSS (12 gauge, 3-inch, 1¾-ounce No. 9 tungsten shot) were fired onto paper targets and into Clear Ballistics gel at 35 yards. Clear Ballistics is a synthetic gelatin created to test terminal performance of projectiles from firearms. The material is completely reusable and transparent, so you can easily see the penetration of bullets or pellets after the shot. It’s really cool stuff and reveals a lot of info. The shotgun used for this was a CZ-USA Magnum Reaper (CZ’s new turkey gun), which is an over-under shotgun with 26-inch barrels. The choke tube used was the Xtra Full choke that’s supplied with the CZ Magnum Reaper. At 35 yards, the Remington Nitro load put 45 pellets in a 5-inch circle, with an estimated velocity of 800 fps; this translates to 204 foot pounds of energy (fpe) delivered to the target. The Federal HeavyWeight round hit the 5-inch circle with 103 pellets, at an estimated velocity of 750 fps, creating 155 foot pounds of energy smacking the target. The Remington lead No. 4s penetrated the Clear Ballistics gel approximately 6½ inches, and the Federal TSS tungsten shot penetrated 6 inches. I found it interesting that the Federal No. 9 TSS shot embedded in a mostly uniform pattern, with the majority of the pellets having traveled the same depth in the ballistic gelatin. The Remington No. 4 lead pellets pierced the medium about 6½ inches — a few went deeper than that, and several traveled less. While I don’t have any real slow-motion video proof, this would indicate the TSS load is delivering the shot charge to the target in an even manner, with a short shot string. Some would say this is an unimpressive showing for the TSS load because it produced slightly less foot pounds of energy and velocity to the target. You must, however, look at the number of pellets. While 45 pellets for the lead in a 5-inch circle is certainly not bad, 103 TSS pellets is twice as good. It should also be noted that a TSS-specific choke tube would produce a higher pellet count on the target. Double the number of pellets would certainly give more room for error when taking a bead on a turkey’s head. A bonus for the advent of using TSS shot is going to be the increased use of the smaller gauge shotguns. You will see more 20 gauge and .410 shotguns used on turkeys than ever before. This will translate to older hunters with bad shoulders, lady hunters, kids and really anyone tired of being pounded by 12-gauge loads going afield, and that’s a good thing. Look for a revival in the use of the .410 shotguns. TSS shot, because of its properties, is going to deliver more shot on target, be it paper, ducks or turkeys. At traditional or moderate ranges (up to 40 yards), some would question the need for the much more expensive TSS loads (MSRP for a box of five 12-gauge, 3-inch Federal HeavyWeight TSS shells is $44.95; a 3½-inch box of five will run about $49.95), but for every hash mark past the 40 yard line, tungsten shot is going to prove its worth exponentially. Think of it this way: How many times are most of us going to pull the trigger during turkey season anyway? 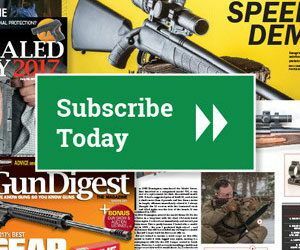 Editor’s Notes: This article originally appeared in the May 2018 issue of Gun Digest the Magazine.